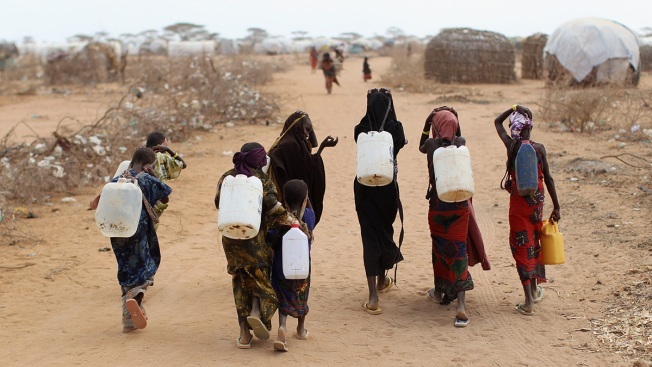 In this July 22, 2011, file photo, Somalian refugees return from collecting water at the edge of the Dagahaley refugee camp which makes up part of the giant Dadaab refugee settlement in Dadaab, Kenya. A seven-month investigation across five countries with significant refugee populations has found widespread reports of the U.N.'s refugee agency UNHCR's staff members exploiting refugees, while victims and staff members who report wrongdoing say the agency fails to act against corruption, NBC News reports. In interviews, more than 50 refugees registered with the UNHCR in Kenya, Uganda, Yemen, Ethiopia and Libya have described corruption and exploitation involving the agency's staff and personnel from other aid agencies, following similar claims by refugees in Sudan last year. Refugees, current and former UNHCR employees, aid workers and two former U.N. investigators say bribery and corruption are found in a variety of services the UNHCR and companion organizations are charged with providing, but report that it is especially unavoidable in resettlement — a precious opportunity for the world's most vulnerable refugees to restart their lives in safe new countries, usually in the West. UNHCR spokesperson Cecile Pouilly said the agency strongly denies the allegations of widespread corruption within the organization.